Have you noticed the trends in the stores lately? 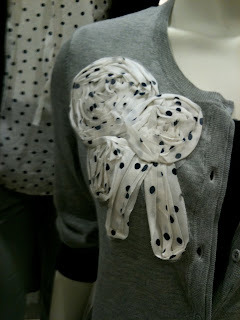 All the fabric-accessorized shirts and cardigans. I'm loving them, but not loving the prices. 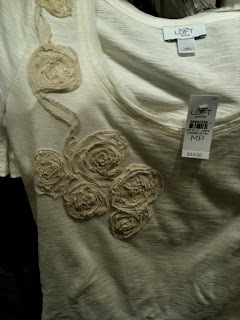 For example, at Ann Taylor Loft, just a plain-ol t-shirt that had a couple extra rosettes thrown on there was $35-50! I kept walking around the store snapping pictures with my camera phone (see below), thinking, "I could do that!!" So I went home and grabbed a short-sleeved sweater that I hadn't worn in a long time - because I just didn't like it that much - and grabbed some white fabric remnants and started designing my own "trendy" shirt. Now this once-drab Old Navy sweater that I never wore, has become a new favorite. And whenever I wear it, I get several comments about where I bought it! This was just a test run, but now that I feel a bit more confident with the concept, I'm totally going to get a bunch of cheap t-shirts and spruce em up for spring with my own fun designs. Do I hear a craft night a-brewin? Who's with me?? 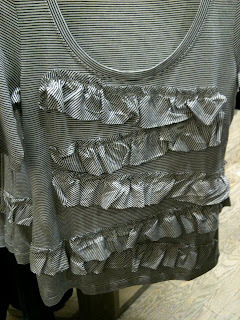 Ok, i have been DYING to try out the refashioning thing with the ruffles and flowers, but have no clue where to start. You NEED to show me how to do this sometime. Yours turned out too cute! I'm there. When Melony sent the link for the flowers on the shirt, I thought it looked too hard but you made it look easy. The headbands looks awesome too. I can't believe the prices of some of those shirts in the stores! Yours turned out so cute.